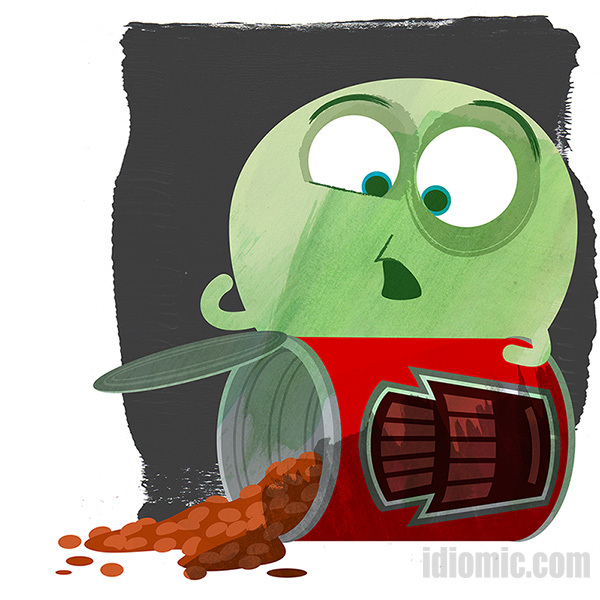 'Spill the beans' illustrated at Idiomic.com: definition, example, and origin. Example: After three hours intensive grilling by her friends, Sharon finally broke down to spill the beans about her night out with the vicar. ‘Spill the beans’ is one of several idioms , similarly phrased, with the same meaning. There’s ‘Spill the soup‘, ‘Spill your guts‘, or the simple and to the point command, ‘Spill!” Spill is used in the manner of letting something out. But beans? Why beans? There is a widely discounted explanation to do with ancient Greece. Voting in some situations called for the anonymous placing of beans in an urn. White for ‘Yay‘. Black for ‘Nay‘. The vote had to be unanimous. So, if somebody knocked over the urn before voting was complete revealing even a single black one, thus ‘spilling the beans‘, the vote was ruined. Sounds excellent. However, there are two millennia between those alleged bean votes and the introduction of the phrase into language. That first modern usage dates back to early 20th century America. Its meaning then was subtly different, more like talking out of turn and causing trouble. A bit like the wartime slogan ‘Loose lips sink ships‘. Iddy’s still not sure why it is beans that need to be spilled. He’d prefer toffees. Or caramels.